Year seven of teaching is upon me! New student orientation day is Wednesday, and all students roll in Thursday. This is, I think, my busiest year yet. But the closer I get to a room filled with fascinating developing adolescents, the more excited I get to impart to them the wisdom of my years (I am turning 30 next year, after all) and empower them with the tools to be successful in this ever-changing world. It is a privilege and a terror, this career choice. But at least for today, I wouldn’t trade it for anything. I’m excited to share some first week routines with my other young teachers out there! In the days leading up to the first day, I am juggling a lot of balls, and managing them with post-it notes along my computer screen. I have large chunks of time between faculty meetings and last-minute eye doctor and haircut appointments, so I try to write a few tasks down and just focus on those. I struggle a lot with what my mom calls, “Squirrel! Squirrel! Syndrome” — I pick up a book and walk to the shelf to put it back. I see another book that I want to pull an excerpt from for sociology. I take it to my desk and look for colored pencils to annotate where I want to read. In my desk drawer I find a box of file folder labels I rescued from a freshman locker in May. I take them to the pile of file folders where I am starting to file papers I’ve just been stacking up in a crate for three years. I see the purchase order for some curriculum books I am ordering. I walk it to my department head’s classroom to get it approved, when we start talking about AP syllabi. Then I have to go to the bathroom. Suddenly it’s time to pick up Spartacus from school and I feel like I’ve gotten nothing done! My view from my desk — I have lots of work to do before students arrive! As I juggle curriculum mapping for accreditation, AP summer reading projects, four preps (English 9, Life 101, Sociology, and 3 sections of AP English), senior student council advising, two kids, one dog, one husband, and a kitchen renovation, it’s hard to find any purchase on this slippery slope. However, there are few routines I do before school officially starts that make me feel “ready.” I have more which I use after the kids arrive (read more here!) but here is my “Okay…let ’em come” checklist. While my rosters may still change a bit before the end of the first week, I log onto our classroom management system (We currently use OnCampus, a Blackbaud product) and copy my roster from each class section into a Google document. I also print a copy and put it on a clipboard hanging by the door for emergencies. I get to look at names and begin to internalize them, and I get a handle on class numbers (one AP section has 27 students; sociology has 14). Thankfully I have enough desks in my room. I do actually still use a paper grade book. There is something very calming to me about copying my student rosters into the grade book, and adding dates to the top of each class page. I use it to track smaller assignments and copy grades if I don’t have my computer handy. I also jot absences down, both current and planned, to help me plan around large field trips. I rarely use an assigned seating chart for my upper-level classes, but I always do for my freshmen. Before the first day, I create a blank seating chart and add in my freshman roster. Seeing actual names on the desks reminds me that I will have actual humans soon to teach. I am blessed with a room-wide white board, and I devote a portion of it to the week’s assignments. 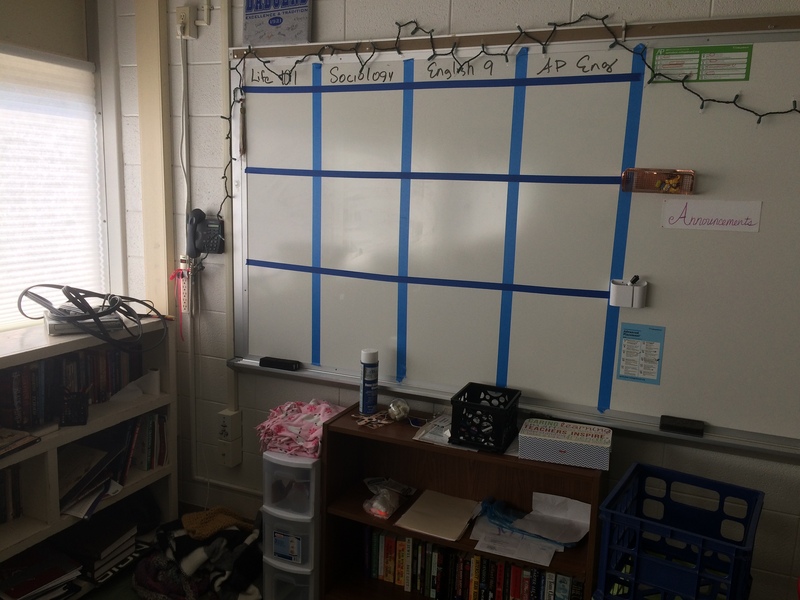 I use blue painter’s tape to lay out my grid, and with our block schedule I can put up the agenda for all three class periods that week. With four preps it takes up a lot more room on my board! 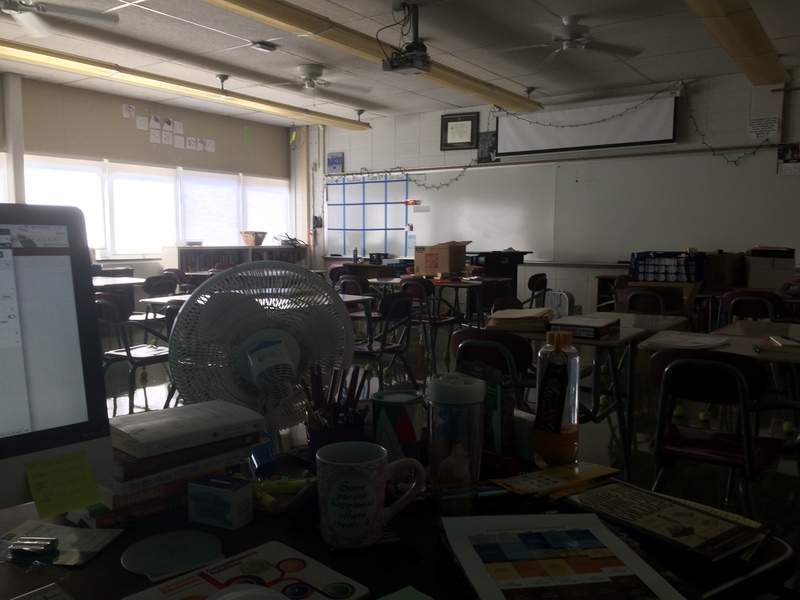 I don’t do nearly as much classroom prep as the average elementary teacher, but I put my classroom in order and clear all my desks in preparation for the first day. 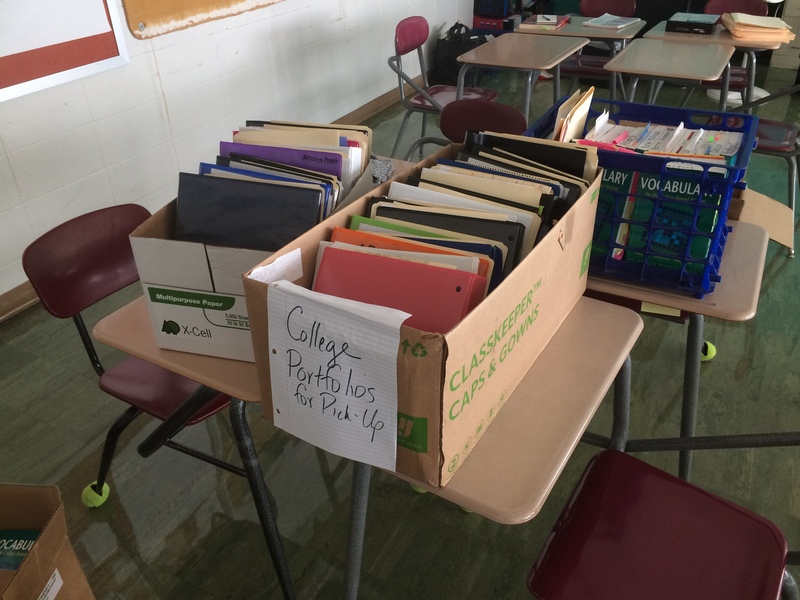 I’m still waiting on some AP students to pick up their college portfolios from May, but otherwise desks are arranged in groups of 4 and ready for their occupants. Every year I try to add one small thing to my room that I’m excited about. This year it’s a small wooden piece that I painted at a ladies’ craft night at church. It has a part of my favorite Bible verse: “Be still and know…” that I am God. Psalm 46:10. A great reminder for the crazy times in teaching! It’s also in a deep orange, one of my favorite colors. I hung it by the cross in the front of my classroom. I’m ready. Year seven, here I come!